Even though Ohio winters may be crisp and cold, there are still many opportunities to get outside and enjoy the season. Grab your winter coat and gloves and head outdoors for a fun-filled day at one of Ohio’s winter festivals. If you think the watching the ball drop in New York City’s Time Square is an event, you apparently haven’t seen Port Clinton’s fish. Yes, fish. A walleye, to be exact. Thousands of people visit downtown Port Clinton each year to celebrate the drop of a walleye fish at the start of the New Year. Walleye Madness has been a tradition for years, and it’s noted as one of the top 10 most unique New Year’s drops around the world. The festivities begin at 4 p.m. on New Year’s Eve with family activities, followed by a New Year’s drop at 6 p.m. for the kids. Music, dancing, and fireworks take place at midnight. For more information, visit http://www.walleyemadness.com. January in Ohio is the perfect backdrop for outdoor ice sculptures. 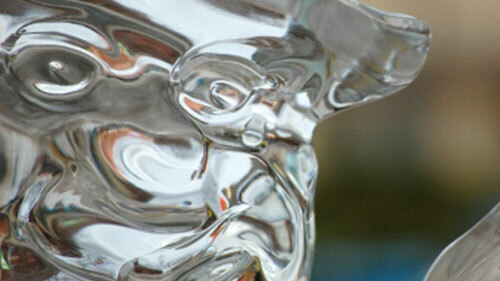 Join the fun at the Mohican Winter Fest on Jan. 10-11, as artists sculpt their ice creations in downtown Loudonville. Visit the train expo and enjoy a family movie event. Take a self-guided winter hike through Mohican State Park, or join the Annual Winter Hike taking place that weekend. Visit festivalnet.com/state/ohio/Loudonville_OH.html, or call the Mohican-Loudonville Visitors Bureau at (877) 266-4422 for additional information. Sponsors of the 2014 Winter Blues Fest in Cincinnati are bringing the party inside for two full nights of nothing but jazz on Feb. 8 and 9. Located in The Phoenix, a historical landmark on Race Street, the event will feature more than 25 local blues bands and two national headliners. Visit cincyblues.org/winter to learn more. Cold weather isn’t going to stop Cleveland residents from getting outside and getting their groove on. The Brite Winter Music Festival in Cleveland’s Ohio City Market District sponsors a free outdoor music and art festival each year for those tough enough to brave the weather. On Feb. 15, thousands will gather to hear musicians perform at the stage located at West 26th Street and Bridge Avenue. There will be additional music programming indoors at nearby businesses. Visit http://www.britewinter.com for program lineup and more information. Bring the whole family for weekend of Winterfest fun Feb. 14-16, in downtown Bowling Green. Children’s activities include snow games and ice skating, as well as photo shoots. Ice carvings and snow sculptures will be available throughout the event, and horse-drawn carriage rides will be available. This event is free to the public. Visit eventful.com/bowlinggreen_oh/events/winterfest-/E0-001-057583597-6 to learn more. There’s no need to stay cooped up through the winter months. Bundle up and enjoy the many events and festivals Ohio has to offer.